Ahed Tamimi, 17, has drawn international attention following her arrest after the Dec. 15 confrontation with an Israeli officer and a soldier outside her West Bank home of Nabi Saleh. Jerusalem: A teenage girl who became a hero to Palestinians after she was filmed slapping and kicking an Israeli soldier in the occupied West Bank appeared in an Israeli military court on Tuesday for the start of her trial. The incident was streamed live on Facebook by her mother and went viral. Tamimi and her mother, Nariman, were arrested a few days later. On Tuesday morning Tamimi, wearing prison uniform and with her hands and feet in restraints, was led into the courtroom at the Ofer military prison near Ramallah for preliminary trial hearings. Her father Bassem, the only member of her family in the courtroom, said to her: "How are you? Stay strong." The teenager faces 12 charges, including aggravated assault. An adult could be jailed for up to 10 years, but such an outcome is considered unlikely for a minor who was 16 when the incident happened. The case has polarised opinion. Some Israelis have accused her of courting publicity and being a troublemaker. Palestinians say she was protesting against Israel's occupation of the West Bank. On the eve of her latest appearance the human rights group Amnesty International called for her immediate release. Outside court, Tamimi's lawyer Gaby Lasky said her family wanted the case to be heard in public, but the judge had ordered the numerous journalists present to be removed from the courtroom for the proceedings because she was a minor. "I think the decision of the court is because the court decided what is good for the court, and not what is good for Ahed," Lasky said. 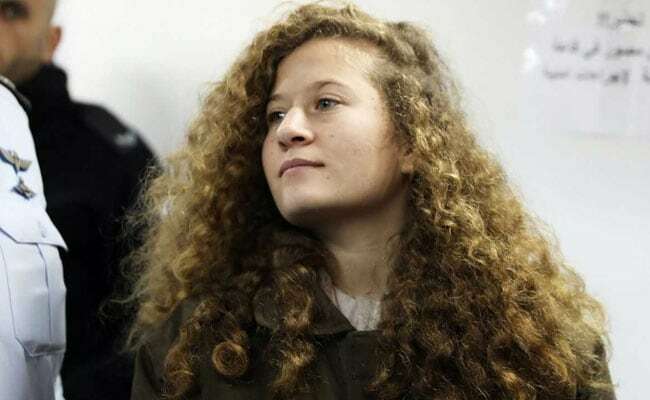 "They understand that people outside Ofer military court are interested in Ahed's case." The case was adjourned until March, and could go on for months. Tamimi remains in custody.